Heavenly Organics is a raw, organic honey company. Founded in 2005, Heavenly Organics produces and distributes organic, non-GMO, fair trade and kosher certified Chocolate Honey Patties™, Raw Honey and Whole-Cane Sugar. 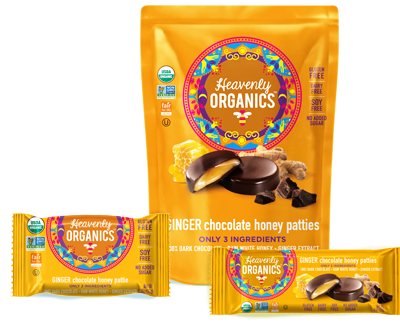 Heavenly Organics Chocolate Honey Patties received the 2016 NEXTY award for Best New Sweet/Dessert. Flavors include Mint, Pomegranate, Almond, Peanut, Double Dark and Ginger. Wrapped in brightly colored packaging, these patties would be the ideal treat for any stocking. Heavenly Organics raw 100% organic honey is so divine and different from other organic raw honeys because it comes from naturally-occurring wild beehives found deep within the pristine forests of Northern and Central India and parts of the Himalayan Mountains. That means that neither the hives nor the free-range bees have ever been exposed to pesticides, pollutants, genetically modified crops or antibiotics. Their honey is chemical free! 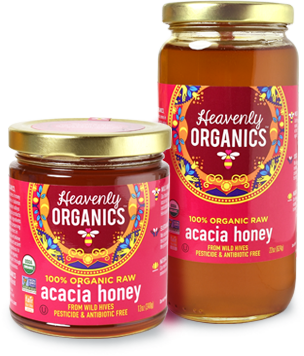 Heavenly Organics is truly something special and is the cleanest sourced honey you can find! You can purchase Heavenly Organics at your local retailer.